Amrut Distilleries Ltd. was founded in Bangalore, India around 1948, initially as a liquor blending and bottling plant. India is the biggest consumer of whisky in the world and the majority of Indian whisky is distilled from molasses. Amrut started using barley in the early 80s, but only launched it's first single malt into Europe in 2004. Jim Murray voted Amrut Fusion as the third best whisky in the world in 2010. 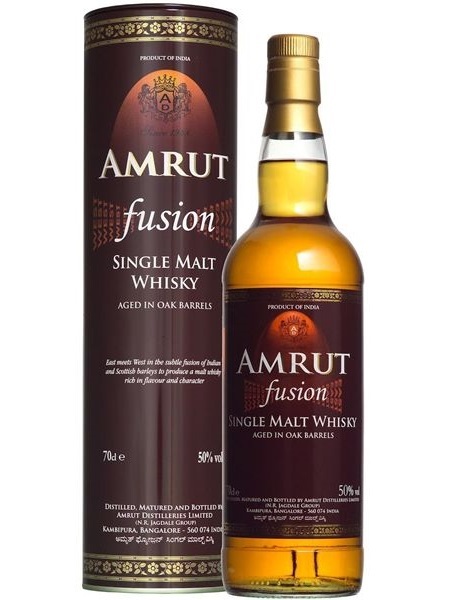 To create Amrut Fusion, where East meets West, the distillery marries together whiskies they've created from unpeated Indian malt and peated Scottish malt. While there is no age statement, the ex-bourbon matured whiskies are only 4-5 years old. The hot Indian climate produces whisky that defies it age. Amrut Fusion is natural colour, non-chill filtered and bottled at 50% ABV.